Yes, The Vatican is “The City” of The Empire Of The City, you could just as well say, “The Empire of the Vatican.” Thru this tripartite division she fulfills every criterion of the Revelation to qualify as Mystery Babylon. You will also notice that “city” is singular in all instances, this is more an indication of proof with the contemporary use in the description: The Empire Of The City. Therefore we have three locations, if not the entire world, to fulfill all of the grandeur, evil and catastrophe applied to the city, Mystery Babylon: Little explanation is necessary when the required criteria are applied to the tripartite administrated New World Social-Economic Order of the Woman that rides the Beast. It would be impossible to apply all of these points to any one particular nation, even The United States of America. The Roman Catholic Church openly rules over more than 2 billion of the world’s 6 billion people through her church hierarchy. The staggering wealth of the Vatican includes enormous investments with the Rothschild’s in Britain, France, and the USA, and with giant oil and weapons corporations like Shell and General Electric. The Vatican’s solid gold bullion stored with the Rothschild controlled Bank of England and the US Federal Reserve Bank is worth untold billions. The Vatican is the biggest financial power, wealth accumulator, and property owner in the world. She possesses more material wealth than any bank, corporation, giant trust, or government anywhere on the globe. While two-thirds of the world earns less than two dollars a day, and one-fifth of the world is under fed, some even starving to death, the Vatican hordes the world’s wealth, profits from it on the financial markets, and at the same time fleeces as much as possible from even its poorest adherents. The Vatican is the very seat of the Man of Sin, the prophesied Anti-Christ of the Apocalypse, the Biblical Book of Revelation. Like Vatican City, London’s Financial District is also a privately owned corporation, or city state, located right smack in the heart of Greater London. It became a sovereign state in 1694 when King William III of Orange privatized and turned the Bank of England over to the bankers. Today the city state of London is the world’s financial power center. It houses the Rothschild controlled Bank of England, Lloyd’s of London, the London Stock Exchange, all British Banks, the branch offices of 385 foreign banks, and 70 US banks. It has its own courts, its own laws, its own flag, and its own police force. It is not part of Greater London, England, or the British Commonwealth, and pays no taxes. The city state of London houses Fleet Street’s newspaper and publishing monopolies. It is also the headquarters for worldwide English Freemasonry and headquarters for the worldwide money cartel know as the Crown. The Crown is not the Royal Family or the British Monarch. The Crown is the private Corporation of London. It has a council of twelve members who rule the corporation under a mayor called the Lord Mayor. 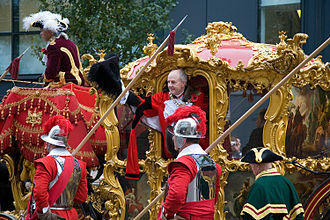 The Lord Mayor and his twelve member council serve as proxies who sit in for thirteen of the world’s wealthiest, most powerful banking families. This ring of thirteen ruling families includes the Rothschild family, the Warburg family, the Oppenheimer family, and the Schiff family. These families and their descendants run the Crown Corporation of London. The Crown Corporation holds the title to worldwide Crown land in Crown colonies like Canada, Australia, and New Zealand. The British Parliament and the British Prime Minister serve as a public front for these ruling crown families. All of these serve the Vatican and as a result have become very rich while maintaining their wealth. Domine Dirige Nos (“Master Direct us”, motto of City of London Corporation). There is no doubt in my mind who their Master is, even the scripture indicates, the Dragon gives them their power. Like the Vatican and the Corporation of London, a third city state was officially created on land ceded by the several Catholic Colonies of Virginia and Maryland in 1790 as the first Act of the American Constitution. The con of the Constitution was veiled, few would perceive or even suspect what was truly behind the reason given for popular consumption, “to form a more perfect union” than had the Articles of Confederation. If not for the insisted upon Protestant Bill of rights, liberty would have perished that day. Sixty years later when the secession movement swept the South threatening the Empire’s DC power center in the new world, the election leading up to the Civil War had one candidate who stumped vociferously for Preserving the Union. The Empire did not want to lose its foothold for total control in the New World so stealthily backed the unwitting Abraham Lincoln who was pressured to keep his pledge to Preserve the Union at any cost, even the cost of the lives of hundreds of thousands of America’s fathers and sons. After the war when Lincoln had turned his back on the money powers and genuinely sought to restore the South to equal footing and original intent of the Union he had outlived his usefulness. The post war, post assassination era was just the time of crisis that the Empire needed to mold America into an image more to its liking. The first giant leap in the takeover of the free nation had just succeeded. With the consequent Reconstruction, the Fourteenth Amendment and The Act of 1871, America would never be the same. The next giant leap would include the 1913 Federal Reserve Coup of the United States Treasury by the City of London Bankers and the introduction of the first world reserve currency, the Federal Reserve Note. Its subsequent Great Depression and the numbering of all Americans through the Social Security System, the cause that began in America has now spread to every nation on earth, a New World Social-Economic Order. Although geographically separate, the three city states of the Vatican, the Corporation of London, and the District of Columbia are one interlocking empire called The Empire of the City. The flag of the District of Columbia has three red stars, one for each city state in the three city empire. This tripartite union controls the world economically through London’s Square Mile financial district, militarily through the District of Columbia, with the Vatican its head and Spiritual as well as Temporal seat for the Vicar of Christ on earth, who is the Pope and the Anti Christ. If we are truly as close to the end of all things and the return of Christ as most believers hold, then we should be able to observe the elements of these things presently coming to fruition. 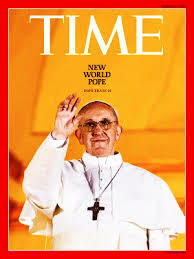 With the recent exposure of the Malachy Prophesy and the installation of the Jesuit Pope Francis I have had the honor of coming into agreement with many Evangelical and Futurist leaning Christians that the final Pope will in fact be the prophesied end time Anti Christ. All of the facts presented here, easily verified on the ground, confirm that the time is right for a one world religious leader and no one is better positioned to fill that role that the Pope of Rome. “How do you practice humility from the most exalted throne on earth? Rarely has a new player on the world stage captured so much attention so quickly—young and old, faithful and cynical—as has Pope Francis. In his nine months in office, he has placed himself at the very center of the central conversations of our time: about wealth and poverty, fairness and justice, transparency, modernity, globalization, the role of women, the nature of marriage, the temptations of power. In 1545, the Catholic Church convened one of its most famous councils in history, which took place north of Rome in a city called Trent. The Council of Trent continued for three sessions ending in 1563. One of the main purposes of this Council was to plan a counterattack against the Protestant Reformation. Before Trent the Vatican’s main method of attack had been largely frontal, the open burning of Bibles and of heretics. However this method only confirmed in the minds of Protestants the conviction that Vatican was indeed the Great Whore that would “make war with the saints” (Revelation 13:7). She has learned the lessons of history very well. The present Pope may or may not be the final one in the line of succession of the “Man of Sin” and if he is not, one just as capable or even more so will follow in his footsteps to fulfill the prophecy completely. Focus your attention on the Lord Jesus Christ, and follow His lead. And everything will be alright. 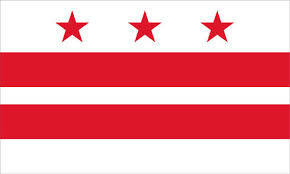 The three stars on the Washington DC flag come from George Washington’s family coat of arms dating back to the 1600’s. Not, three city states. I noticed you Italicized the words Virginia and Maryland. Washington DC is Virgin Mary Land. I also came across this and came to the same conclusion from Wikipedia. Great minds think alike. But spare a thought for the Virgin Joseph the Worker, husband of the Virgin Mary. He has been made the patron saint of Labor Unions. Mayday, Labor Day, May the 1st, is the feast day of St Joseph the Worker. The Communists and Hitler also affiliated with Trade Unions. An instance of this can be read in Mein Kampf. Vatican doctrine is that the Virgin Mary was sinless from the instant of her conception, same with Satan, created perfect (meaning without sin) from the instant of his creation. Satan was perfect in wisdom. The Virgin Mary personifying the RCC Vatican claims infallibility, she ex coelestia, he the Pope agent of Satan ex cathedral. Satan was perfect in beauty, she is all beautiful – tota pulchra she herself claims, as the image made to speak from heaven, courtesy of her Assumption (educatedly guessed, ascended into heaven) as purposed by Satan in Isaiah 14:14 ascending above the heights of the clouds. There is enough information in Ezekiel 28 and Isaiah 14 and Isaiah 47 whereby enough clues are given to identify the Prince of Tyre as the Pope, head of all secret societies on earth (Ezek 28:3), wise as a god – infallible. Clues equate also to the Virgin Mary as Lucifer, Satan, Day Star Son of Dawn (Venus) and Jezebel (Rev 2:20) encouraging, enticing, urging, seducing, beguiling and willing God’s servant people, Israel, to partake of communion before the sacrifice to idols. Eucharist, mass and crucifix encompass the ritual of eating food offered in sacrifice to idols. This sacrifice is ‘celebrated’ by Satan’s church ritualistically as they practise canniballism by the eating of human flesh and blood, under the appearance of bread and wine which by sorcery is transubstantiated. Parts of the Mass include the Secret and the Offertory. Condensing : – ‘food offered in sacrifice to idols.’ All in the name of Jesus Christ in vain – falsely. Wolves as sheep. Satan is to be cut down to the ground after bringing down the nations Isaiah 14:12. The Virgin daughter of Babylon is to be cast down to the ground Isaiah 14:1 and the Virgin Mary says in Crown of Twelve stars that she will become Queen by Conquest. Rockefeller said a NWO WILL come into being whether by peaceful means or by conquest. Reblogged this on Disrobing The Emperor. The iChannel program “Closer to Truth” with Robert Lawrence Kuhn gives a very good backgrounder on just how difficult the exploration of the relationship of creation to its origins actually is, and that there is a need for precision in the claims that are made on the nature of God. thank you for putting this information together in such a concise manner. I pray people wake up to the truth. I am very recently discovering , and believe the common law still can be used today ,Common law now means to use decisions by others court and judges to decide a current case. The legal system in place in America ( and most of the world ) at this time is run by the cult of Saturn through the temple Bar ( or the Bar association ).The current legal system is unlawfull , and it requires a valid bonified contract to hold someone accountable , but they will never tell you this , they presume you are under contracts , and if you do not bring the presumptions to light , it is assumed, by the court , that you are under contract .What you have is corporate thugs, driving around forcing the unsuspecting populace into alleged contracts under threat of force or incarceration . , It is based upon a system where the prosecution/ claimant is allowed to make presumptions which must be addressed to ” put the ball in their court” so to speak .It goes like this …Prosecutor ” Mr smith , I believe you went outside last night and looked up at the stars, and because you have done this unspeakable horror , the court is going to charge you $100 dollars ” Mr Smith ” well no actualy I slept in bed all night and never got up ” Prosecutor ” realy mr smith , can you prove you never went outside last night and looked at the stars ? your freedom requires that you do ” Of course poor Mr Smith cannot prove he did not do something, plus there is a corporate thug , a “special” witness to testify against Mr Smith , so he digs deep .what needs to be done is to challenge the presumptions, challenge jurisdiction , and challenge the contract. under the Clearfield trust doctrine , if the government wishes to compel an individual to a specific action, not only must there be a valid contract , but they must be willing to produce/present it at court. Go to any legitimate hard copy legal dictionary and look up the definition of a contract. I believe you will find all those documents where you are the only signer are not binding contracts, in fact they do not fulfill any of the requirements of a lawfull contract . If you fall into the trap of letting them presume there is a contract, if you do not refute it, the court moves forward , and you lose ! ..hello…..yes this is true….don;t sign any papers….even if a gun//jail etc is used by them..lo….